The eneloop pro Ni-MH "Low Self Discharge" batteries utilize Panasonic's advanced rechargeable battery technology. The eneloop pro battery cells deliver consistent power performance, come pre-charged and are ready to use out of the package. These eneloop cells also have increased power, added storage life and extreme temperature performance. The eneloop pro, Ni-MH rechargeable batteries feature added mAh power, making them the perfect choice for DSLR flash units, game controllers and other devices that require additional power. 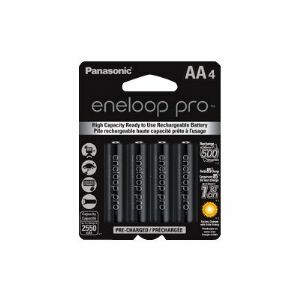 While eneloop pro batteries were designed to provide more power for high drain devices they will also perform well in conventional devices that require AA or AAA batteries.